Pupil detection and eye-tracker using the openEyes toolkit. This module implements an eye tracker, which is based on detecting the outline of the pupil. Note that the camera has to be very close to the eye for this to work well. To be useful in practice, some sort of prism or tele-lens should be used so that the camera can be out of the field of view of the human participant. This module can easily run at 120 frames/s. Establish a calibration procedure, whereby the participant will be asked to look at small dots at known locations on the computer screen. This will allow a comparison between coordinates of the pupil center as reported by JeVois and coordinates on the computer screen. Compute the calibration transform (mapping from pupil coordinates reported by JeVois to screen coordinates) based on the data obtained by the calibration procedure. This has to be done once for each participant and eye-tracking session, or every time a participant moves her/his head by a large amount. On new eye-tracking sessions, convert pupil coordinates reported by JeVois to screen coordinates. If desired, extract events in the raw calibrated data stream, such as fixations, rapid saccadic eye movements, smooth pursuit movements, and blinks. Definition at line 70 of file DemoEyeTracker.C. Definition at line 75 of file DemoEyeTracker.C. Definition at line 79 of file DemoEyeTracker.C. Definition at line 82 of file DemoEyeTracker.C. References jevois::rawimage::cvImage(), jevois::RawImage::height, itsEyeTracker, jevois::RawImage::require(), jevois::Timer::start(), jevois::Timer::stop(), jevois::RawImage::width, and jevois::rawimage::writeText(). 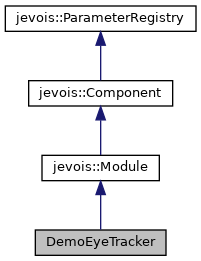 References jevois::rawimage::cvImage(), jevois::RawImage::height, itsEyeTracker, JEVOIS_REGISTER_MODULE(), jevois::RawImage::require(), jevois::Timer::start(), jevois::Timer::stop(), jevois::RawImage::width, and jevois::rawimage::writeText(). Definition at line 120 of file DemoEyeTracker.C. Referenced by DemoEyeTracker(), and process().